This fantastic yachting ensign has seen significant breakdown of the stripe material, but the canton, which is doubled over, remains in very good condition. The flag is extraordinary because of its workmanship. It is the finest constructed 13 star yachting ensign I have encountered in many years of collecting. 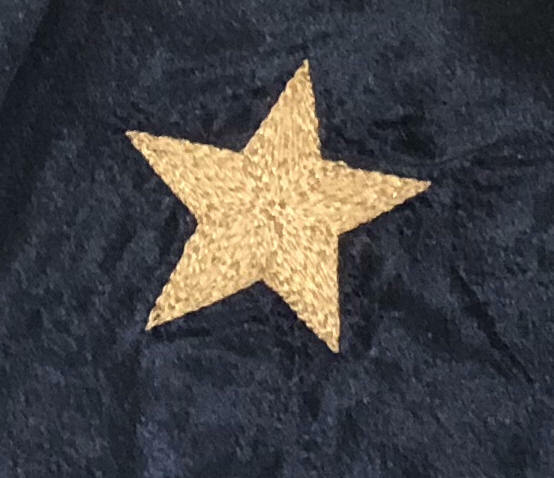 In addition to being made of silk, the finest material used for flag-making in the 19th century, the stars and the fouled anchor in the center of the canton are entirely hand-embroidered in silk thread with the finest and most precise stitching I've seen on an embroidered flag. The color of the silk fabric is rich and striking. 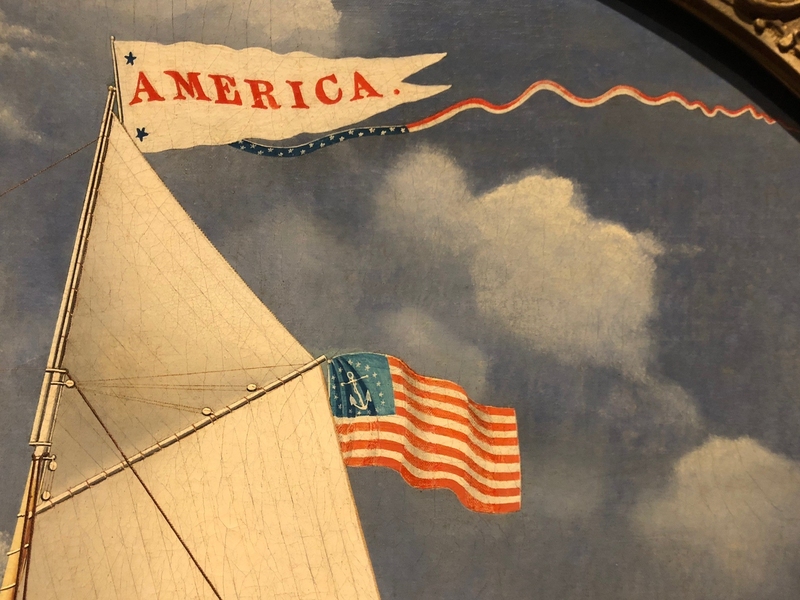 The yachting ensign was approved in 1848 for use on civilian sailing vessels, and those flying the flag were not stopped for the collection of tariff revenues. The practice officially ended in the 1980's, but the flag is still flown on pleasure boats and yachts today. 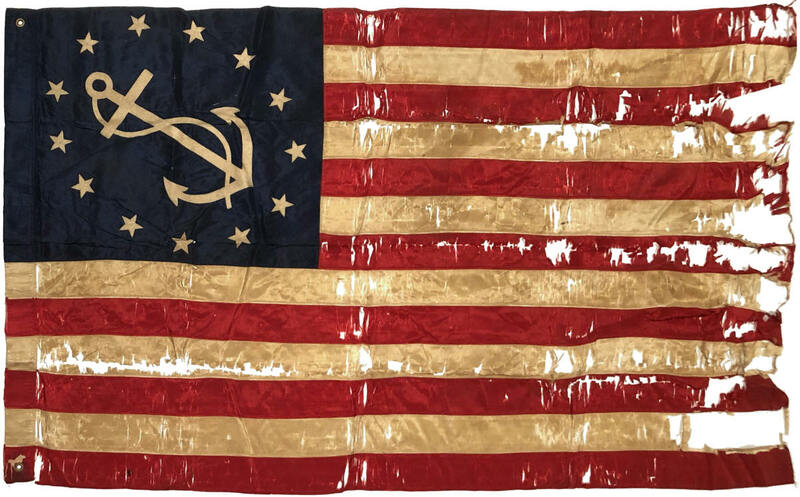 Based on the type of brass grommets used, as well as the color and condition of the silk, and the fine handiwork of the flag's construction, I'm comfortable dating the flag to the early 1850's to mid-1860's era. When framed, the flag can be backed with silks of the same color as the stripes, with the resulting conserved flag appearing complete and intact. In the mid-19th century, merchants began to price silk fabric by weight rather than by size. As a result, many sellers began to soak their silk in mineral salts which were undetectable, but which made the silk heavier. Such "weighted silk", however, proved to be very fragile since the mineral salts caused the silk to break down over time. Finding brittle silk flags from the mid-19th century, especially from the Civil War period, is common. Many Civil War battle flags are in very poor condition because of this. 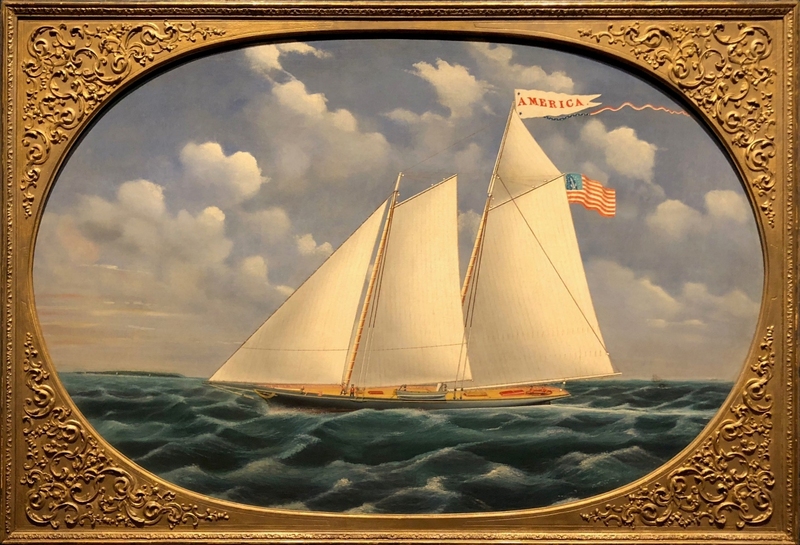 Below are images of the Schooner Yacht America, New York, New York, 1851, painted by James Bard, which provide a wonderful image of how a flag such as this would have been seen and flown. The painting is in the collection of the Abbey Aldrich Rockefeller Folk Art Museum in Williamsburg, Virginia. note the style and presentation of the yachting ensign, to include the quirky elliptical star pattern, which is comparable to this flag.